Sony has announced a latest additions to its wildly popular Cyber-shot T-Series lineup – Sony Cyber-shot DSC-T900 and DSC-T90. 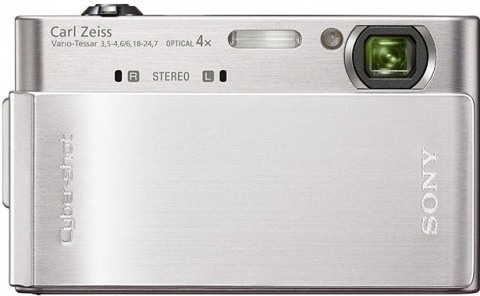 These stylish and ultra-slim digital cameras which feature the same 12.1-megapixel resolution, 4x optical zoom Carl Zeiss lens with Optical Steady-shot stabilization, enhanced Face Detection, Smile Shutter technology, 720p movie recording capability (30 frames per second), and intelligent auto mode that can detect scene conditions then adjust settings to get the best shot in difficult lighting scenarios, aiming for picture-perfect shots. According to Sony, the new Cybershot T900 which measures only 16.3 mm thin will incorporate high-resolution (921,600 dots) 3.5-inch Xtra Fine LCD touchscreen display and stereo sound recording capability, while the Cybershot T90 that measures just 15 mm will sport 3-inch wide touch-panel LCD display. The new elegant and ultra-sleek Sony Cyber-shot T900 (available in silver, black, red and bronze colors) and Cyber-shot T90 (available in silver, black, pink, blue and brown) digital cameras are expected to hit the market in coming April for about $380 and $300, respectively.